Predictably, voters across the state are receiving some wildly sneaky mailers leading up to the Nov. 6 election. In the future, stricter disclosure of who's paying for dishonest ads could help act as a deterrent. State Democrats are understandably livid about a series of misleading campaign mailers popping up in key legislative swing districts. 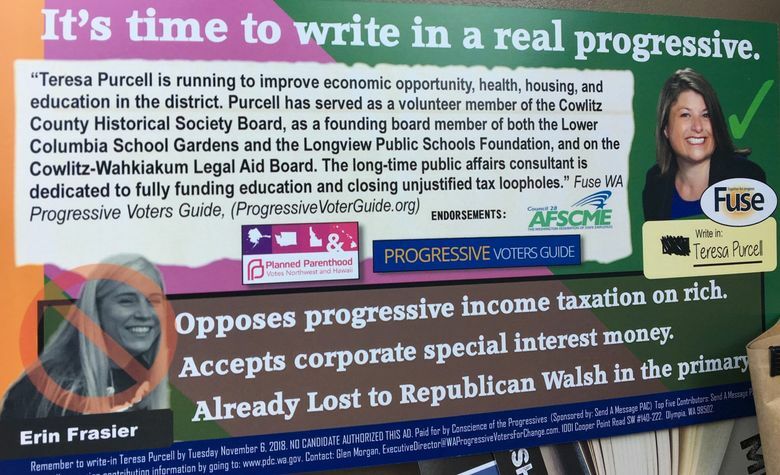 These direct-mail ads, which look as if they are coming from progressive groups, urge local voters to reject the Democratic candidate on the ballot and write in another “real progressive” instead. Just by looking, you might not know the ads were paid for by conservatives looking to sway close races. That’s partially because the mailers say they are bankrolled by a group called Conscience of the Progressives, whose sole donor is another committee called Send a Message PAC. These ads are wildly deceptive. Yet amazingly, in certain ways they actually are more transparent than state law requires. The conservative activist behind them, Glen Morgan, took the unusual step of including his name and email address on the mailers, when he legally could have hidden behind the two mysterious political-action committees. Not all groups have been as forthright. A political committee called WA Forward sent a mailer that smeared a former addict turned lawyer as a means of attacking a candidate who supported her. The ad listed The Leadership Council as the sole donor. Without additional research, the average voter wouldn’t know this was a PAC tied to state Senate Republicans. Meanwhile, Democratic groups have sent attack ads under the guise of a committee called Mainstream Voters of Washington, with the mailers listing only the innocuous-sounding New Direction PAC and Justice For All PAC as top donors. This tactic of using a series of shell PACs to conceal the true forces behind political advertising is nothing new. But while this so-called “PAC washing” is technically legal, it would be in Washington voters’ best interest if it were banned. To that end, state lawmakers should revive legislation next year that would force these political committees to list their true donors on their advertisements. This would close a loophole in the law that is too easy for campaigns to exploit, to the public’s detriment. “The most aggressive negative ads oftentimes have the actual donors obscured, because people don’t want their names associated with these sleazy ads,” said state Sen. Andy Billig, D-Spokane, who sponsored this year’s attempted fix, Senate Bill 5108. In theory, political committees buying independent-expenditure ads are already supposed to list their top-five donors clearly on their advertisements. So are committees urging voters to support or reject ballot initiatives. But by routing money through vaguely named political-action committees, these political groups may list only these shell PACs in their disclosures, rather than their top individual, union or corporate contributors. To an extent, that’s also what Morgan has done with the faux-progressive ads, which have appeared in the 47th Legislative District, the 26th District, the 6th District and the 19th District. Had Morgan not directed contributions through a second political action committee, he would have been legally required to list himself on the ads as a top-five donor, along with Peter Zieve, an aerospace entrepreneur from Mukilteo who has expressed jarring anti-Muslim sentiments. Sneaky use of interconnected PACs also played a role in one of the state’s biggest campaign-finance scandals, this one orchestrated by Democratic groups. In 2010, the liberal political consulting firm Moxie Media was working to elect a progressive Democrat, Nick Harper, to replace a more moderate Democratic state senator, Jean Berkey, in Everett’s 38th District. Shortly before the August primary, Moxie created PACs with conservative-sounding names to attack Berkey as being too liberal. Those PACs sent out mailers and robocalls urging conservative voters to instead cast their ballots for a little-known third party candidate, Rod Reiger. Reiger edged out Berkey for a general-election ballot spot but went on to lose big to Harper. While Moxie Media was slapped with a six-figure fine over its actions, Morgan appears to have avoided some of the same reporting errors (which went far beyond layering PACs). Still, many people have filed complaints about Morgan’s ads, which falsely suggest certain progressive groups are endorsing candidates who are not currently on the ballot. Those complaints are now pending before the state Public Disclosure Commission. But the shady stacking of PACs isn’t their main focus, since that alone isn’t illegal. These gaps in the law illustrate why the 2019 Legislature should revisit Billig’s proposal. His bill would require political ads to list the top-five individuals and entities who donated money, as opposed to just the top five contributing PACs. This would mean drilling down to the bottom level of political committees to determine actual donors. Voters should be able to look at political ads and quickly discern who is trying to influence them. Legislators should pass a version of Billig’s legislation next year to help make that happen.